The Iowa pork industry has a long history of honoring producers who excel in the production of hogs and this is another significant award that has been handed out since 1958. Sponsored by the Iowa Purebred Swine Council, the Master Seedstock Producer Award is designed to recognize significant contributions to the Iowa and national purebred industries and for evidence of genetic improvements within their selected breeds for the benefit of Iowa, the nation and, in many cases, internationally. That initial 1958 class consisted of Wilbert Meinhart of Hudson, Wallace Lang and his son, Tom, of Brooklyn and Bernard Weed and sons of Ute. Over the years, recipients of the Master Seedstock Producer Award have become a virtual “Who’s Who” of seedstock producers in Iowa purebred circles — the Friedows of Kanawha, the Hirsches of Indianola, the Stewarts of Waverly, the Eddie brothers of Storm Lake, the Conover family, Curtiss of Churdan, the Olsons, the Huinkers, the Christians and so many other distinguished producers. With thousands of people involved in pork production in Iowa, it is a rare honor to receive the award and more than 100 Master Seedstock Producers have now been recognized since the award’s inception. The Master Seedstock Award is presented annually by the Iowa Purebred Swine Council to recognize outstanding seedstock producers who exemplify integrity, leadership and success in the production and promotion of the purebred swine industry. We’re proud to introduce the recipient of the 2017 Master Seedstock Producer Award. Schminke and his wife, Kandy, started raising market pigs together more than 45 years ago. After their children became more interested and involved in the family swine operation, they started to focus more on the show ring instead of commercial production. Both of their children were highly competitive and enjoyed spending their time exhibiting pigs at the local, state and national levels. In their Schminke Genetics farrow-to-finish purebred business, Al and Kandy focus on raising Chester White’s and F-1 show pigs. To maintain their elite lines of offspring, they choose to sell their very elite boars as well as show pigs and gilts. They also hold online auctions selling bred sows and show prospects in fall and spring. The Schminke’s efforts have paid off with numerous awards over the years for their children and customers. They had the Champion Chester White Barrow at the 2017 Ohio State Fair Open Show, the Grand Champion Chester White Barrow at the 2016 Houston Stock Show, the Reserve Champion Chester Barrow at the North American Livestock Expo in 2014, and the Grand Champion Chester White Barrow at the 2013 American Royal, Team Purebred Junior Show and the National Stock Show. These are just a few of their many show ring success stories across the country. 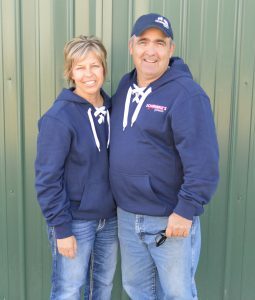 This community-minded couple is actively involved in their local church and volunteer at various events with the Benton Community FFA Alumni Association. Al and Kandy have hosted local swine judging teams to practice and prepare for competitions. Al is a past board member of the Iowa Pork Producers Association and is currently a member of the Iowa Purebred Swine Council. Al and Kandy have raised two children. The Iowa Purebred Swine Council has sponsored the Master Seedstock Award since 1958 and has selected one Master Seedstock Award recipient each year since then. Its purpose is to recognize significant contributions to the Iowa and national purebred industries and for evidence of genetic improvements within their selected breeds for the benefit of Iowa, the nation and, in many cases, internationally.